For many of us, coffee is an integral part of the morning routine. We encourage you to celebrate the coffee-making ritual by bringing elegant design into the process. Explore innovative new styles alongside design classics with this collection of coffee makers. 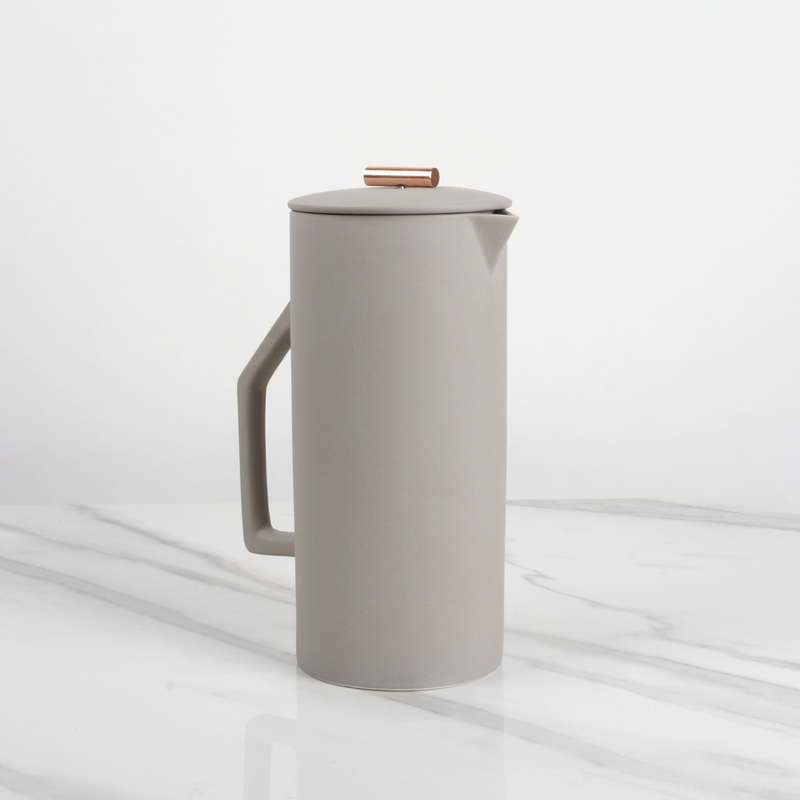 A new arrival to the Dwell Store, the Ceramic French Press Coffee Maker from Yield Design Co. is a sophisticated vessel that captures the traditional French press method while elevating the look of the device. The coffee maker is comprised of a heavy walled ceramic pot that maintains a consistent temperature throughout the brewing process. The ceramic pot features a matte exterior that provides a pleasant tactile experience when in hand, and contrasts the interior high gloss finish of the vessel. The cylindrical pot includes a simple pour spot and elegant handle. The lid features a shiny copper pull, and includes a fine mesh steel filter for expert brewing. The French Press is made in partnership with a Fair Trade ceramics house in an ancient village near Hanol, Vietnam. Designed to be durable enough to last for a lifetime, the Kaico collection is an enduring classic that blends function and thoughtful Japanese design. The Kaico Enamel Coffee Pot is designed with an elegant and elongated spout, making it easy to pour into a mug or teacup. Thermal efficient, the simple enamel pot heats quickly on a stovetop and is easy to use and clean. The coffee pot features a simple lid with a turned maple accent, and it is neutral enough to coordinate with an existing collection of pots and pans, or can also be used with other Kaico enamelware products to give a cohesive, minimalist look to kitchen cookware. The collection also includes a tea kettle, saucepan, milk pan, pasta pan set, and pot. A brand new addition to the Dwell Store, the Bruer Cold Brew Coffee Maker is an innovative kitchen product that allows people to brew cold brew coffee in their own homes. Cold brew coffee is a smooth coffee that is less acidic and bitter than hot brewed coffee. The process extracts different compounds from the coffee, giving it a different flavor than hot or iced coffee. Constructed in durable borosilicate glass, the pitcher is a transparent vessel, revealing the process behind slow drip cold brewed coffee. The Bruer brews up to 20 ounces of coffee in as little as four hours, and the convenient adjustable valve allows users to experiment to make the perfect cup of coffee for them. The six-cup espresso coffee maker that started it all, Alessi's 9090 was the first object for the home in the company’s history, as well as its first product to be inducted into the Permanent Design Collection at New York’s Museum of Modern Art. The stainless steel body and cast iron handle give a strong sensibility to the coffee maker that is balanced by the smooth cylindrical shapes of the body and base. Designed by Richard Sapper, the 9090 was also the Italian brand’s first "amphibious object": a tool for the kitchen so beautifully designed that it is equally welcome at the table. With the Hario Drip Kettle, it’s easy to take the simple task of brewing morning coffee from stale to sophisticated. Used as a pour over brewer, the stainless steel kettle has an ergonomic design and features a long, slender spout that’s ideal for steady, continued pouring over coffee grounds. Pouring in this way ensures an even saturation of grounds, as well as sustained extraction. Aside from the flavorful cups of coffee the kettle yields, it’s also stunning to look at with its subtle, undulating curves and delicate spout. It’s a kettle that deserves to be displayed after use. The Hario Drip Kettle works excellently when paired with a manual coffee maker, like the Hario Drip Pot.